And they discuss. Can't you hear him: " I dig that guy!" A funny collection of tourist shots! Her er det vel god plass for en oppfølger også. Morsom serie bilder. I love your tourist captures, Rune! Some great giggles to brighten a dull, gray day! And, yes, I can hear him! Tourists are fun to watch -- for the most part! Hope you've had a good weekend and wishing you a great week ahead. What great photos. 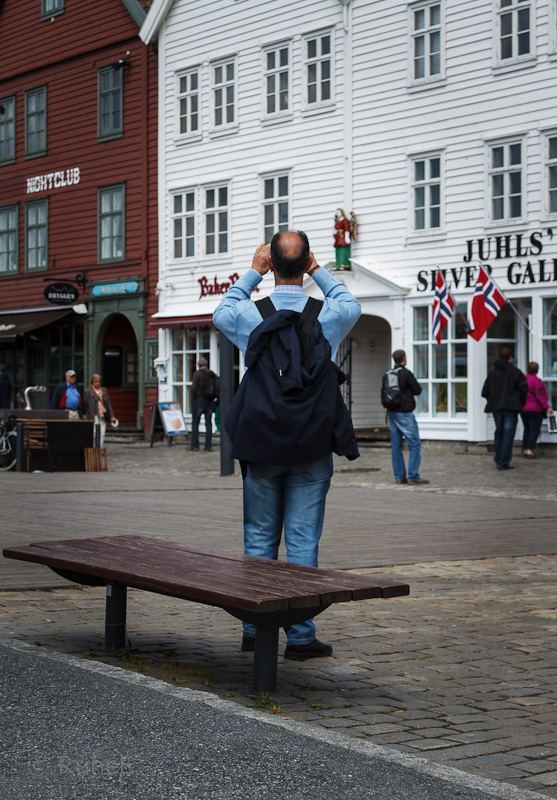 I know that my friends have really enjoyed photographing Bergen and I imagine they must have looked just like that. By the way, I went to an introductory Norwegian class the other day! I can say, "Jeg heter Mandy og jeg bor i London". yes...been there, done that!!!! loved our visit in bergen...so picturesque. At der er motiver i Bergen, ja det skal en jammen ikke nekte for selv om en er Trønder du. Fortsatt god sommer til deg Rune, nyt hver dag uansett vær. You have a direct approach to photography that I admire very much. Your power lines photo is terrific. Tourists are quaint, odd, comical, except when I'm the tourist--wordly, knowledgeable, hip. LOL! Love these street photos. 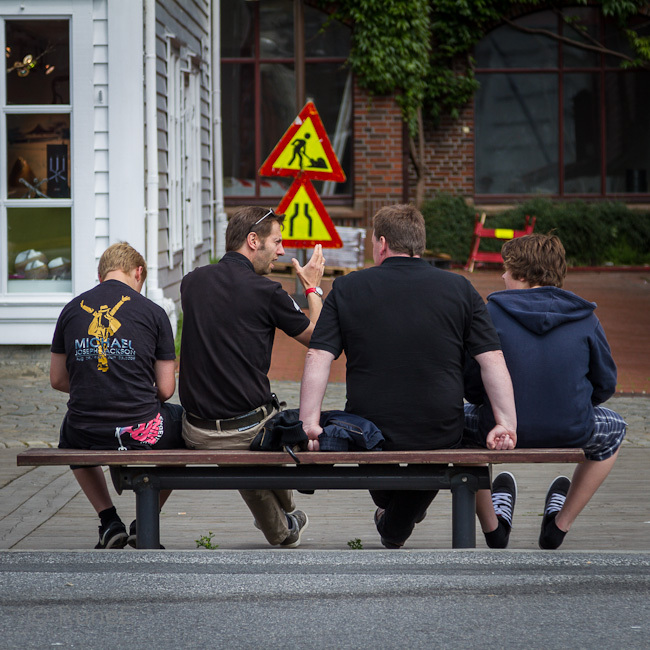 Holidays, benches , pictures , and Norway.. The kind of mix I adore! :o)I'd like to be one of them! great idea showing visitors photographing your wonderful Country my friend. Awesome. This made me dream to tour that place too. If I were there I'd be taking photos for sure! I want that little wooden figure to swoop down and smash her camera. is that so wrong? 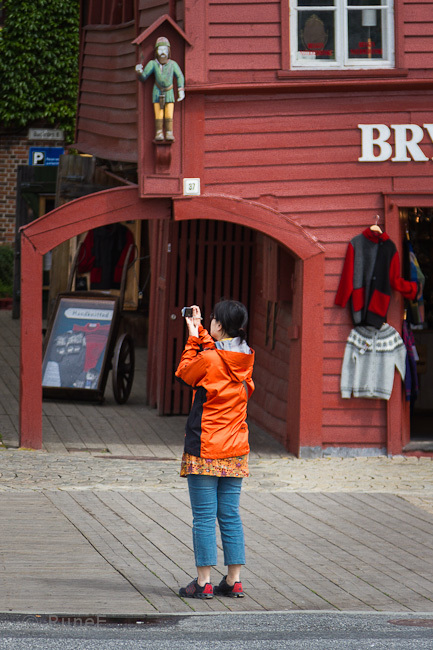 So much fun seeing the photos of tourists taking their own pictures. Bergen must be truly beautiful and it was great seeing some of them doing what tourists do, but I'm surprised too that you didn't show them eating some wonderful food somewhere. As an occaisional tourist, I can tell you that one of my favorite things to do is eat something that the part of the country I'm visiting is famous for, plus the fact that I just love to eat. As for the guys sitting on the bench, I definitely can hear them! Hilarious, and yet so true. When I lived in NYC, you would see the big tour buses (sp?) come through, drop off the tourists and they would run around for 10 minutes taking pictures (mostly of each other in front of landmarks) and then get back on the bus again! The last group is far more animated than the rest of the tourists.